Re:visioning HANJI exhibition showcases artworks made from Korean traditional paper hanji. Two artists, Ran Hwang and Aimee Lee, have each developed their own contemporary aesthetics and styles based on the traditional modes of mastering the paper in artistic forms. The exhibition is on view until March 31 at the Korean Cultural Center in New York, and connects to the Asia Week New York. In the old days, the masters of the Korean paper manufacturing were called jijang. This profession was proudly inherited and passed on to the next generation. The art of Korean paper making is a complex production process starting with a fiber of mulberry tree. It has developed into multiple use of materials and techniques that are still valid today. Historically, paper was not only applied into books, but its role was more daily as functional material in architecture and clothing. It was also part of making calligraphy, painting, money and armor. The remarkable part of early Korean paper manufacturing was connected to Buddhist scriptures. The paper process starts with harvesting. A year old mulberry fiber is harvested during the time of November – February, when the plant has enough moisture and the fiber is soft. The skin gets steamed right after harvesting to make a peeling process easier. The entire making is ecological and does not harm nature in any way. After washing and drying, boiling, and peeling cycle, the fiber is used to make hanji. Then the project involves beating the fiber so paper will become thinner and tougher. Finally, the fiber needs to be dissolved and sieved into paper. Jiseung is an indigenous art form that Koreans have practiced for hundreds of years. It evolved from hanji; when books were printed and bound, the trimmed edges were saved and used further in making baskets and decorative items. The paper rope became popular, because it was softer than straw, but as strong, and available for use. Many of the traditional pieces have gotten lost through wars and modernization. 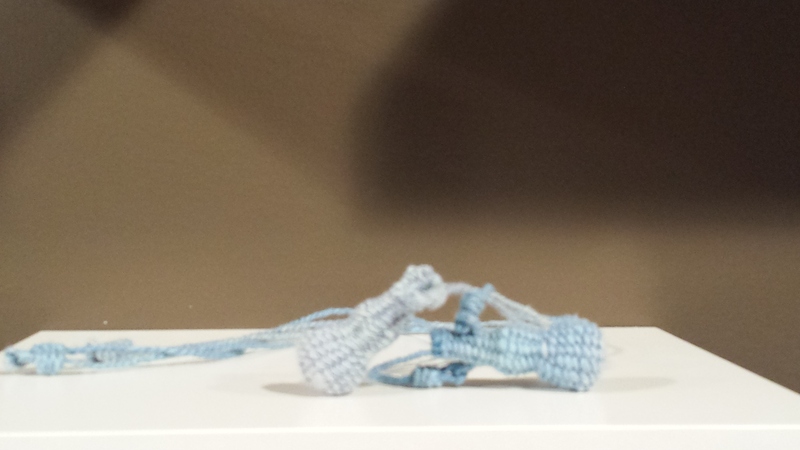 Yet woven hanji artifacts still include everyday items such as shoes, baskets, wallets, backpacks, and lanterns. For young Korean-American artist, Aimee Lee, the idea of 100 percent hanji includes making the paper herself. She then weaves and naturally dyes the materials used in the artworks. Eventually her objects take a form from the traditional dimensions, gestures and environments. Lee says that her pieces borrow from the historical artifacts. 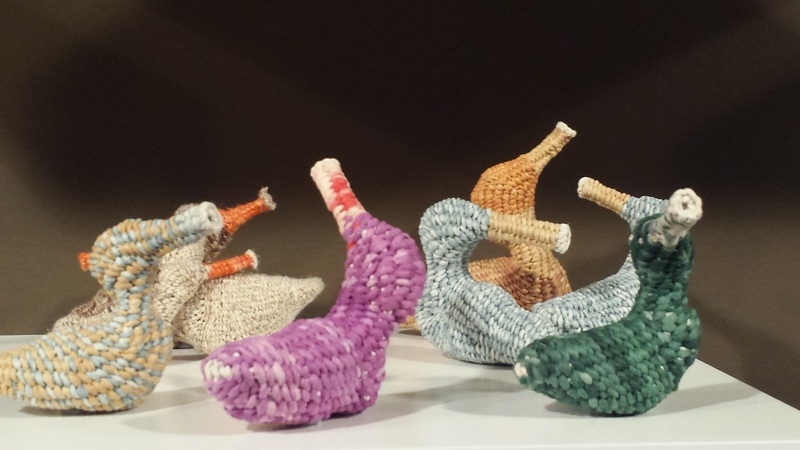 The wedding ducks, which were traditionally given to Korean bride and groom, are one example of this long history. The artist plays with the proportion and shapes creating unique contemporary versions of the objects. She states that none of the original materials went to waste, because paper was so durable and labor intensive to make. Repurposing the paper is a way to connect to the tradition and stories. Paper was carrying secret messages during war. People made sandals out of civil service examinations and other certificates. Aimee Lee, objects from Hanji Ducks and Pot -series. Corded and twined hanji. Korean-born, internationally acclaimed installation artist Ran Hwang creates poetic pieces out of materials that are deployed in fashion industry. She uses handmade hanji buttons to create monumental pieces in installations that display iconic images. 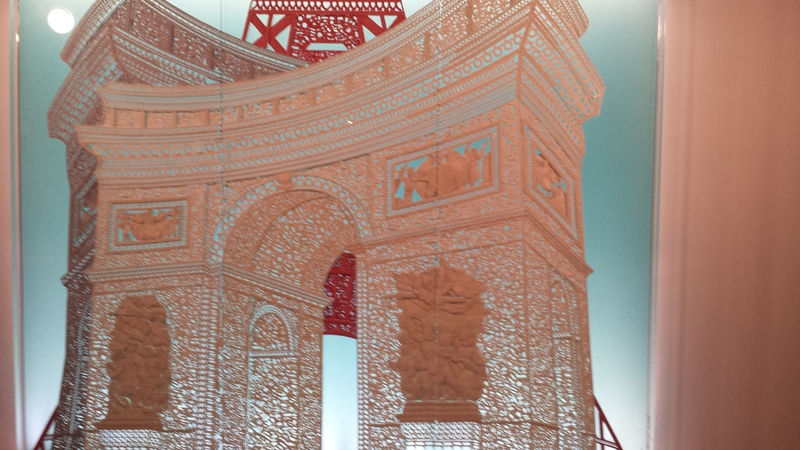 Her 9 feet tall work that displays Eiffel Tower and Triumphal Arch, required hours of securing handmade materials on plexiglas panel. The Beginning of the Bright piece, includes also Hangeul, the Korean alphabet. The work was displayed in Paris at the UNESCO headquarters to celebrate Hangeul’s designation as world cultural heritage. For Hwang, the lengthy hours of making the works means hammering each button on pins for approximately 25 times. The work is like meditative ritual similar to those of the zen-masters who concentrate on their practice for hours at a time. Ran Hwang, The Beginning of The Bright. Hanji Hangul Buttons, Pins on Plexiglas, 2015. 86.6 x 106.3 inches. Hwang creates three types of series, including, the plum blossoms, the birds and spiders, and architecture. The blossoms refer to ephemerality, to the endless circulation of life, which flowers depict when growing and falling. Architecture, like palaces, are symbols of power, which in the art also imply tragic events like invasions and deaths. The small creatures, birds and spiders, represent states between restriction and freedom, implying a constant flux and wandering in life. The artist states that all her work is in a state of fluidity. Nothing is fixed or permanent. The art evokes a dialogue between fleeting and the eternal. Ran Hwang, Contemplation Time, Paper Buttons, Beads, Pins on plexiglas, 2014.